Just when I think I've figured out most of the weather charts, the nerdiest of all charts emerges: The Nomogram. The nomogram shows the distribution of p-type trends as a function of partial thickness values. 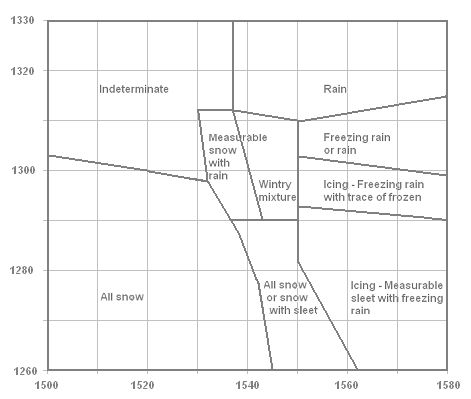 Close examination of precipitation events over the past 30 years accounts for the boundaries on the nomogram separating the various p-type trend areas. Mid level thickness values increase from left to right along the x axis. Low level thickness values increase from bottom to top along the y-axis. The last revision to the predominant p-type nomogram (winter 2006/2007) was focused on the central region of the nomogram where many events occur with weak thermal advection and/or surface based melting layers that can result in near freezing isothermal layers. This part of the nomogram requires the forecaster to be especially aware of the so-called secondary p-type factors that can become larger players for controlling precipitation types. These factors include evaporation, melting, precipitation amounts, and precipitation rates. Changes to or mixing with other p-types are in part determined by noting which predominant p-type category the thickness values are trending toward. When the partial thickness values are located near an adjacent p-type category and are trending toward that adjacent category, forecasters should reflect this trend in their 6 hourly forecast of p-type.